Tue, 1 Feb 2011 | Published in I Was There . . . When stepping into the P.I.T.’s (People’s Improv Theatre) great new space on the east side, one does not entirely expect to see something that is exactly the opposite – a fully scripted sketch comedy show. Of course, a known theatrical adventurer, I’m all for the occasional pleasant surprise and Standing Reason, their new show written by troupe member Tim Eberle and directed by Danny Williams, provided exactly that. The video that started the 45-minute show was a touch long but provided enough chuckles to get the evening’s comic ride started off right. What followed was a short series of modestly funny sketches that tied together nicely in a style reminiscent to the thematic, nonsensical cohesion perfected by The State years before. My personal favorite moments were call backs to previous bits, including a socially pliable bartender and a good ol’ fashioned Rashomon rehash set in a public toilet. Hey, who says everything needs to be so highbrow? We are in a recession, folks. All told, Standing Reason is a fine enough excuse to get out of the apartment on a blustery New York City evening and get your perennial fix of feeling all “cultured” and “hip.” In this reviewer’s humble opinion, any theatre show under an hour in total running time starts out at an A+ for me. 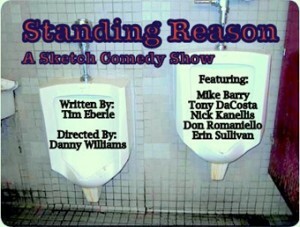 I recommend taking in a few quick chuckles with Standing Reason, then maybe follow Mr. Eberle’s suggestion and hang out with the troupe members, boozing it up in the front room bar after the show.